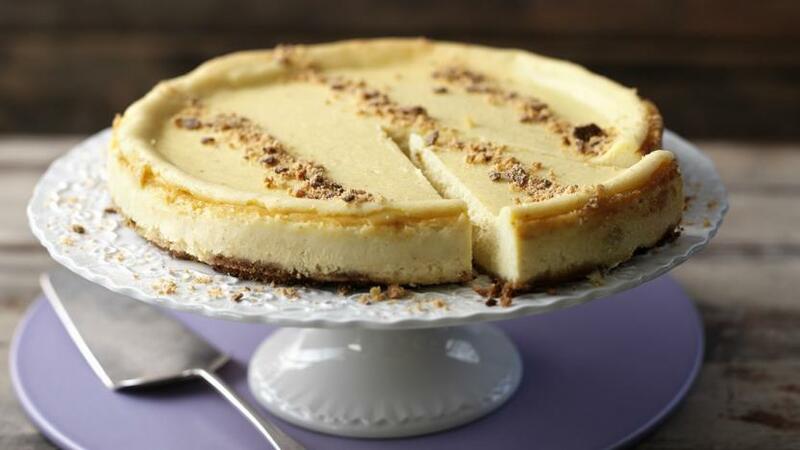 This classic baked cheesecake with a naughty white chocolate centre is sure to impress your guests. Beat the cream cheese in a bowl until soft, then add the eggs one by one, along with the seeds scraped from the vanilla pod. Melt the white chocolate in a bowl set over a pan of gently simmering water, then fold in the crème fraîche until smooth. Fold the chocolate mixture into the cream cheese mixture. Grease a 25cm/10in cake tin and sprinkle the base with the biscuit crumbs to cover. Pour the chocolate and cream cheese mixture into the tin and bang down on a firm surface to remove any air bubbles. Bake in a low oven, 150C/300F/Gas 2, for 45 minutes-1 hour, or until the centre is just firm. Allow to rest for several hours to firm up, before turning out and serving.